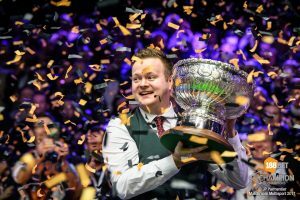 Shaun Murphy survived a Ronnie O’Sullivan fightback to win the 188BET Champion of Champions at Coventry’s Ricoh Arena. Murphy had led the best of 19 final 9-5 before an O’Sullivan surge took the score to 9-8, and he looked set to level until he missed the green, allowing Murphy to finally complete his victory, and claim the title and £100,000 winner’s prize. O’Sullivan led early in the match at 0-2 but four consecutive frames saw Murphy gain a two-frame advantage. The Rocket fought back but, with the scores tied at 4-4, the final frame of the afternoon session saw a dramatic conclusion. 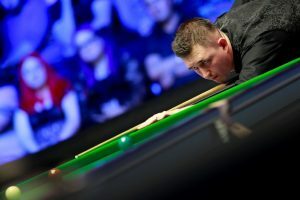 Murphy, four points behind, missed the black to the bottom right pocket, seemingly setting up the five-time World Champion to take a lead into the evening session. But he also missed to the same pocket allowing Murphy to make a long but straight-forward pocket to lead 5-4. The Magician then came out firing in the evening, taking the first three frames for a commanding 8-4 advantage and he looked set to move to within one of the title before he went in off with just the colours remaining. O’Sullivan made no mistake in punishing the Gibraltar Masters champion. Murphy moved a step closer to the title with a 71 clearance for 9-5, but then O’Sullivan mounted his comeback. First, he took a scrappy 15th frame 31-76 and then the final’s only century, a 108, put The Rocket just two behind Murphy. An outrageous fluke helped O’Sullivan to 9-8, but the fluked red aside he was now playing much more confident snooker. 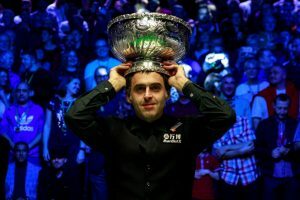 O’Sullivan looked set to force the decider until be missed the green at, allowing Murphy to the table to finish the match. 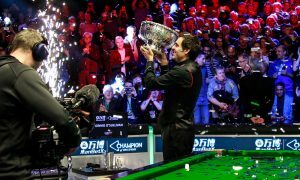 “These are the moments you live for as a snooker player,” said Murphy. “Ronnie is the best player of all time, the best player we have seen and the ultimate test. To play him in a big, big final and get to ten first – because I very nearly didn’t – is an amazing feeling. “We call it dead-man syndrome – people play like they have got nothing to lose and he started going for shots which we all know he can get, and they started going in. 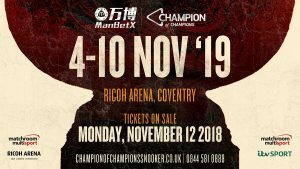 Murphy becomes the first player to qualify for the next Champion of Champions, which will be staged at Ricoh Arena, Coventry from November 5-11 2018 with tickets on sale Monday, November 13.